Not your typical washing machine, steam dryer and dishwasher filler hoses! Used by premier home builders and recommended by some Home Owners Insurance Companies. We are so confident in our product that we now offer an industry leading ten year Limited Warranty. Our assemblies are made with high quality solid brass fittings, Stainless Steel Braided PTFE Tube that is non-aging unlike rubber. Rubber hoses or even stainless steel braided rubber hoses deteriorate over time and cannot endure the constant pressure that modern appliances can produce. With city water around 80 PSI our hoses are considered Burst Proof because every washing machine hose we make is tested to 1,000 PSI before it leaves our facility. Our hose is rated for -100°F to 475°F which makes it excellent for cold weather climates and hot weather climates alike. If you need to run the hose outdoors we make your hose. The following hoses are a typical 3/8 ID hose with ¾″ connectors mainly used with home washing machine, steam dryer and dishwashers. We also make custom configurations upon request! Don't see the size you are looking for, give us a call! Male Straight by Female 90°, 12 inches OAL. Brass Fittings, PTFE Stainless Steel Braided Hose. 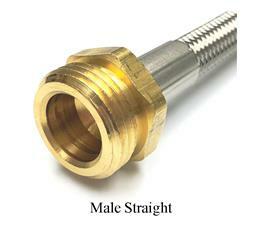 Male Straight by Female 90°, 24 inches OAL. 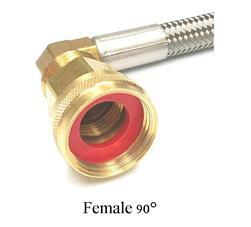 Brass Fittings, PTFE Stainless Steel Braided Hose. 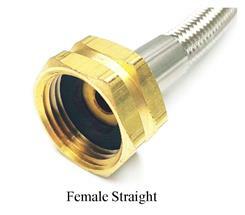 Male Straight by Female 90°, 36 inches OAL. 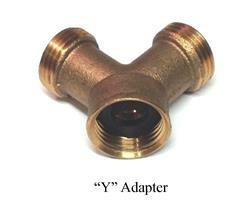 Brass Fittings, PTFE Stainless Steel Braided Hose. Washing Machine Kit, two 2 ft. hose assemblies, Female by Female. Washing Machine Kit, two 3 ft. hose assemblies, Female by Female.